Back to unearth more buried treasure from the vast landscapes of Bandcamp, April’s edition sees us going pretty heavy on the death and black metal spectrum. With one notable exception (Ashencult), this month stands out as a group of albums that you will need to shell out some cash for. Fear not, all the bands listed below are more than deserving of throwing a few bucks their way. That’s what these features are all about anyways! This month we take a gander at A Loathing Requiem, Aether Realm, the aforementioned Ashencult, Black Fast, Botanist, Hoth, Thunder & Lightning, and Xanthochroid. An oldie but under-rated goodie! A Loathing Requiem is the brainchild of Inferi mastermind (amongst other bands) Malcolm Pugh. This is quite technical (even in comparison to Inferi) but songwriting never suffers from it. On the contrary, Pugh is able to compose stunningly technical material that keeps your interest not just because of the skill level, but many of the songs are just plain catchy somehow despite the frequently dizzying speed. Perhaps it’s due to the ‘get in fast and get out’ song lengths, but it’s much more inviting to replay-ability than most in this field. You’d never know this was a one-man project, which is a testament to Pugh’s abilities across the board. Easily one of last year’s best, it just missed my top ten (though the more recently released single, “The Magician” made it into my top 10 songs). Taking furious melodic death a la Dark Tranquillity and Kalmah with the epic grandeur of Ensiferum and Wintersun, Aether Realm jokingly claimed the tagline “We are not from Finland” and for good reason. Most US bands can’t execute this level of melody without resorting to the cheap stuff (eg: clean choruses). They keep things from getting too cheesy with the synths, keeping it upbeat and melodic but never hokey. Anyone familiar with the band is eagerly awaiting round two. Having some previous exposure to Ashencult with their excellent split with Mephorash (also available at Bandcamp), Black Flame Gnosis is their 2012 debut, which is just as strong as the recent split. Expect some vicious black metal here, melodies notwithstanding, served up at a thrashy pace. There’s a bit of an occult vibe as well, most notably at the tail end of the disc, featuring nothing but distorted chants and screamed vocals as the album comes to a close. The production keeps the grit required for this type of endeavor while allowing the melodies to be heard without straining. Solid US black metal, with hopefully more to come soon. 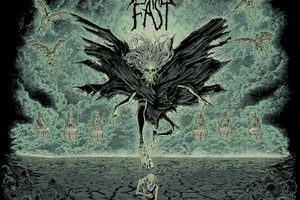 Anyone interested by the riff machines that Revocation routinely churns out would do well to check out Black Fast. Starving Out the Light is chock-full of interesting and memorable thrash riffs that are enhanced by some Chuck-influenced vocals. Some of the nastiest riffs they offer up appear on “Starve” and “Obelisk” (which has an awesome Death vibe), but it’s hard to choose between tracks with the abundance of killer solos as well. The whole album is a real headbanger from start to finish. It’s hard to see these guys staying unsigned much longer with the amount of energy on Starving Out the Light. Botanist relies on vocals, drums, and hammered dulcimer. That’s right, there are no guitar parts in the band’s brand of unorthodox “eco-terrorist” black metal. They weave between some doomier, atmospheric material and dulcimer raging blasts. Much of the time, the dulcimer is distorted which furthers the black metal sound and the odd, croaked vocals may take some getting used to. In fact, this is certainly a band that you will either love or hate, due to the eccentricity of it there’s not much room for middle ground. But for the metalhead that must hear it all, this is an experiment that has gotten better with time. Star Wars plus metal, what’s not to like about this? Even their logo looks like a Tie Bomber! Musically speaking, this is pretty straightforward death metal with an ear for melody but the concepts keep things interesting. Fun, catchy numbers like “Torn Asunder by a Wampa” and “At the Helm of the Executor” lay down plenty of groove while “The Frozen Wastes of Hoth” is suitably cold with more of a blackish vibe and synths. “The Rancor” injects a healthy dose of melody to an album that does seem to check off a number of boxes on the black/death realm. Unleash your inner nerd, the force is strong with this one! Thunder and Lightning play traditional/power metal that gives its nods to the old guard, but plays it with a bit more edge. A story about a woman who kills Death, the concept nicely ties the songs together and features some cool comic book-ish artwork. The heft of the guitar department and emphasis on some shred as opposed to pomp as well as Dittmar’s charismatic vocals make this one a real keeper, particularly for one like myself who is quite fussy with traditional/power metal. They even pull off a ballad (“Two Sons in My Sky”) without resorting to cheese! Though they may get a higher profile for their gorgeous acoustic cover of Wintersun’s “Land of Snow and Sorrow” (a must hear! ), Blessed He With Boils is equally worthy of praise. With forward thinking akin to Emperor and Opeth, this is a roller coaster ride of storytelling (in both the musical and lyrical sense) that feels gargantuan in size and scope. Screams, roars, cleans, chants, the vocals are shared to enhance the experience with varies from acoustic to blast beats and hits nearly everything in between. A young band with loads of potential, expect the red carpets to start rolling out for these guys with their next release.